[Pascal] wrote his many fragments on large sheets of paper, separating each by a horizontal line. When a sheet was full, he would then cut the paper along the horizontal lines, so that each fragment was self-contained on a strip of paper. These strips of paper were then grouped into piles. Pascal then poked a hole in the top corner of each of the strips and joined them by running a thread through the hole, forming a bundle. Any of the bundles were thematically grouped — for instance, fragments on human vanity, or boredom, or religious despair were each sewn together. But other bundles don’t appear to have any thematic grouping, and many of the fragments are not sewn together at all. What the reader confronts is a book that is, in every way, unbound. That sense of “unbound”-ing lies at the center of the whirlwind of thought that comprises Cosmic Pessimism. Thacker, a professor at the New School, has recently published a trilogy of books, Horror of Philosophy, which looks at the seemingly doomed project of existence through the lens of the horror genre. In an interview regarding the project, Thacker speaks about some the effects horror seems to produce in the human psyche. If one looks back “at the history of horror film and the way that monsters or creatures are represented, there’s something about the formulas that seems to hit a nerve with many people. In part, it could be because philosophers, such as Aristotle, tell us that life is defined by form and being formed and having a boundary and an outline.” This fear of formlessness gives insight into Cosmic Pessimism, a work that eludes form. For Thacker, pessimistic thought connotes a non-order, a sense of “gloom,” in which mood takes precedent over the coherence of logical thinking. But, as he notes, a “cosmic” pessimism follows with “a necessity and possibility of order.” Thacker’s order is necessarily based on a sense of disorder, the book itself not neatly demarcated into chapters. Ideas diverge as threads of thought are introduced without the need for overwrought explication. Thacker takes up a line of pessimistic thinking descended from Schopenhauer through Nietzsche and Cioran, a lineage of pessimistic thinkers, each influencing the next. They also composed in aphorisms, the totality of individual statements burnishing hierarchical thought. The book, as an entity for learning, depends on sequential thinking, moving from point A to point B, a notion that Thacker’s pessimism implicitly rejects. Why move from point A to point B if there is no point? Why not shift and stutter and take up new ideas as the writing composes itself? 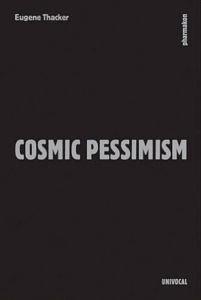 Thacker spends the early portion of Cosmic Pessimism elaborating upon a series of definitions of the term. In fact, much of the text attempts to formulate inspired comparisons. Pessimism is many things. If it is grounded in Thacker’s “cosmic,” it’s ordered through a continuous branching out of thoughts that do not settle. Definitions aren’t sufficient in and of themselves. They continually expand outwards, suggesting new ways to view the term. Thacker repeats the statement “pessimism is” several times. And it is simultaneously, “the nightside of thought, a melodrama of the futility of the brain”; “a lyrical failure of philosophical thinking, each attempt at clear and coherent thought, sullen and submerged in the hidden joy of its own futility”; “the lowest form of philosophy.” In this space, cleared away from an imposed rigor or philosophical formality, Thacker is playful, even inverting his own attempts at picturing pessimism as all-pervading doom. In describing it so fully, so completely, he insists on the possibility for an avenue for all this built up negativity. Futility is a chief concern: a failure to continue life’s project due to an unceasing belief in the impossibility of ever truly arriving anywhere. Futility functions as a continuation of, or the ultimate extension of, failure and fatality, arising “out of the grim suspicion that, behind the shroud of causality we drape over the world, there is only the indifference of what exists or doesn’t exist.” This indifference of the world, of our surroundings, leads to attempts to settle the score, to purge us of this difficulty, and remind ourselves that futility is not necessarily defined by all-pervading defeat. Or perhaps it is. In Thacker’s most interesting reflections he asserts the relationship between pessimism and “the failure of sound and sense, the inarticulation of phone and logos.” Earlier, he personifies pessimism, describing how “its voice cracks, its weight words abruptly reduced to mere shards of guttural sounds.” This inability to speak and communicate, is produced both by the futility of doing so as well as in the futility in even attempting to do so. His inhibited communication becomes articulated in these fragments of ideas, meditations without a delineating path. There is no conclusion. Though he is not employing a new form for his writing, Thacker is claiming it, or a version of it, for a notion of pessimism that is expansive, both cruel and debilitating as well as light and even freeing. Another flight of thought focuses on these philosophers’ notebooks. If Nietzsche valued “the incomplete thought,” then the notebook must be a logical place to locate them. Thacker is descriptive, noting Nietzsche as a “fastidious user of his notebooks, often writing on the right-hand side only and then flipping the notebook over, allowing him to fill notebooks front-to-back and back-to-front.” Schopenhauer wrote in many notebooks simultaneously, some “remained fixed on his desk at home, while others could be taken with him on walks.” Cioran preferred to write in “the bright, multi-colored, spiral notebooks used by students.” As important as what these philosophers thought about pessimism, it is equally important for Thacker to think about how these thoughts are composed. The non-thought, or the thought that does not seek completion, insists on the necessity for certain forms of thinking to remain outside of order. The pursuit of the incomplete thought necessitates a different understanding of the world, one that relinquishes in defeat, annihilation, non-thinking. From a blurred horizon, quiet black-basalt pools bore into the rocks and our own patiently-withering bones. Slumbering swells of a salt-borne amnesia course through our fibrous limbs. Scorched, wandering brine secretes from every pore. But there is a seriousness in this passage at odds with other portions of the text, where he writes with an easiness about uneasiness. He is spare with his thoughts, theorizing with conviction without ever attempting to convince entirely. 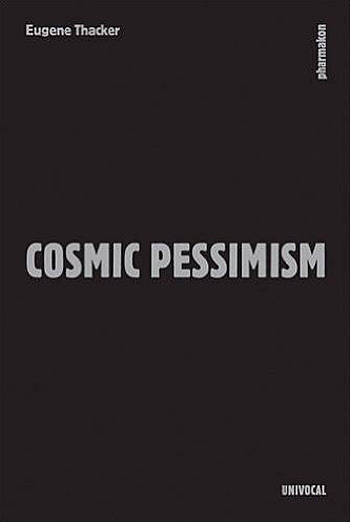 By defining pessimism repeatedly, he compares it to music, imagines a lexicon of terms that abet a “cosmic pessimism,” he stutters. He attempts to articulate what is inarticulate and in doing so, reverses, hedges, begins anew. Thacker leaves room for error so as to position the text as an embodiment of error. So perhaps these further excursions into descriptive bleakness often feel at odds — too earnest. They lack the ease that make for reading on bleakness so fun. Maybe the self-seriousness is necessary; perhaps Thacker tripping up on his attempts to describe his futility is less fun than poking at it. Perhaps some sense of futility in the writing gives more credence to his ideas. Thacker’s text isn’t a monument; it isn’t even a book, as he himself asserts. It isn’t a “whole.” It’s a site for movement where the reader can rethink his or her relationship to optimism and pessimism, success and failure. Cioran has written, “Nobility is only in the negation of existence, in a smile that surveys annihilated landscapes.” Thacker’s text works through some of the sentiment here but in recognition of the paradox of even thinking this kind of thought. How joyful can non-existence be to the non-existent?